This cinnamon french toast bake is perfect for a holiday brunch! Made without cream or butter, it's a light & healthy (but decadent-tasting) dish. Tell me, what’s your breakfast weakness? Pancakes? Waffles? Mine is French toast. Eggy bread that’s soft in the middle and crisp around the edges with a good dash of cinnamon throughout… what’s not to love? 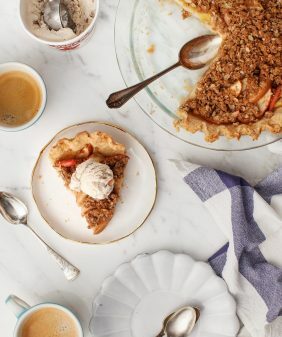 Well, it can often be quite an indulgent sugar bomb, which is why I like to make it at home where I can use ingredients that are a bit lighter. 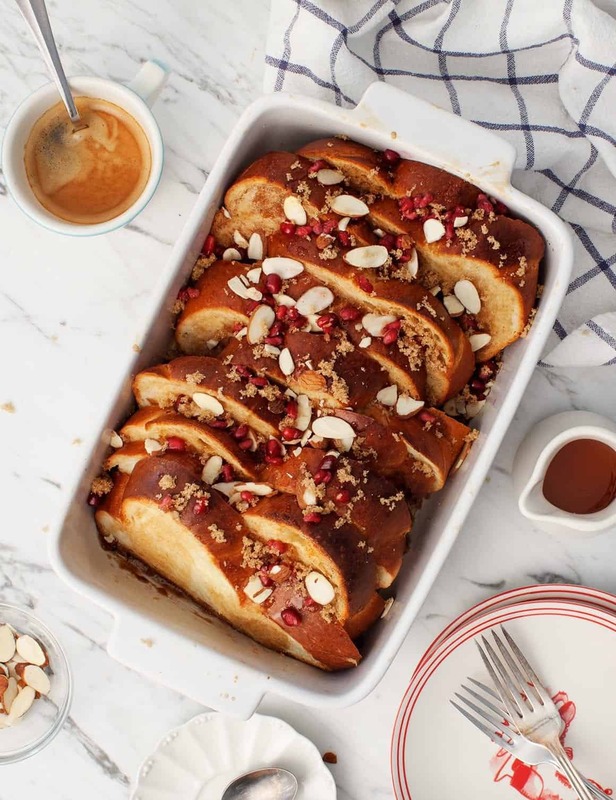 I usually make French toast on the stovetop for just myself and Jack, but today I’m sharing this baked version that would be so delicious for Christmas morning or a holiday brunch where you’re cooking for more than 2 (though Jack had no problem finishing this off…). This French toast is lighter than most – I swapped out heavy cream for almond milk, and instead of regular sugar I used Truvia Brown Sugar Blend. I get SO MANY requests for lower sugar recipes with stevia-based sweeteners. 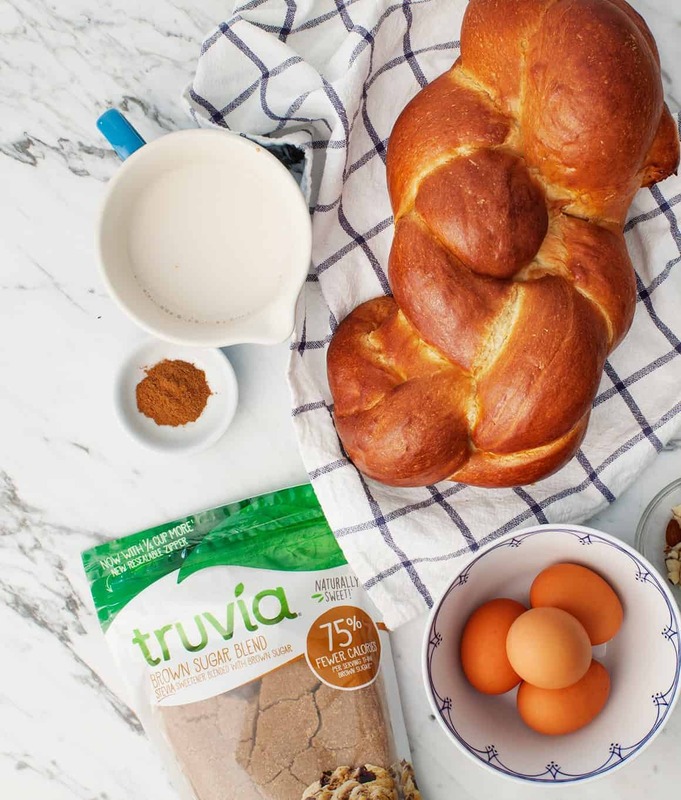 That’s why I’m happy to share this recipe in partnership with Truvia. The best thing about the brown sugar blend is that the texture is the exact same as regular brown sugar. I mixed it with cinnamon and sprinkled it all over this dish before I baked it. It caramelized on top in the oven giving the top of the bread a delightful crisp edge. This recipe is super easy to make. Start with challah bread that’s a few days old and slice it pretty thick. Dip it in the egg/almond milk mixture, and load it into the baking dish. Sprinkle with more brown sugar and cinnamon mixture before baking. Once baked, I topped mine with pomegranates and toasted almonds, but feel free to serve this with whatever toppings or fruit you like – blueberries or raspberries would be delicious! 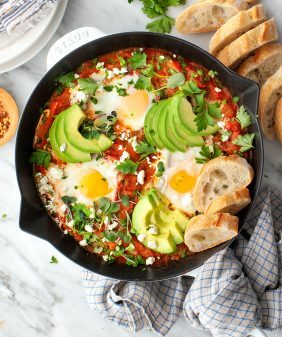 This recipe makes a hearty brunch on its own, but if you’re hosting a larger gathering, baked oatmeal, fruit salad, breakfast casserole, or a frittata would all be great choices to go with it. Happy brunch-ing! This cinnamon french toast bake is perfect for a holiday brunch! It's a healthy (healthy-ish) recipe made without heavy cream, but tastes every bit as indulgent. Preheat the oven to 350°F and lightly grease a 9x13 baking dish with nonstick spray or olive oil. In a medium bowl, whisk together the eggs, almond milk, 1 tablespoon brown sugar, 1 teaspoon of cinnamon, and sea salt. In a small bowl, stir together the 3 tablespoons of brown sugar and ¼ teaspoon of cinnamon. Dip each slice of bread into the egg mixture and overlap them, slightly tilted, in the baking dish. If one side of your loaf is higher than the other, alternate the slices as you place them in the dish so the tops are vertically equal. This will help them bake and brown more evenly. Sprinkle with the brown sugar/cinnamon mixture and bake for 30 minutes or until the eggs are set and the top is golden brown and crisp. Top with the toasted almonds and fruit and serve with maple syrup, if desired. Would you believe it, but I’ve never had French Toast!! I’m definitely more of a savory person, so it kind of just never happened. 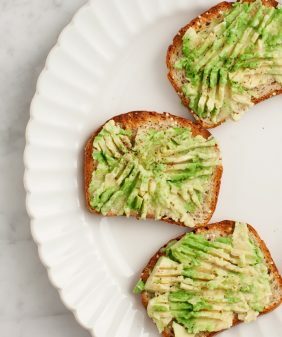 I love the idea of baking it though, that sounds like it adds a nice texture to the toast. 🙂 Happy Holidays, Jeanine! I love your recipe! It’s very creative and different, I prefer this variation in the oven, it doesn’t need as much fat. The bread you used looks a lot like Tresse (au beurre) or Zopf. It’s a very traditional thing in Switzerland, we eat it on Sundays (actually every day). But Challah is jewish isn’t it? I wonder how these two sorts of bread are connected. I’ve had french toast before, but it never came to my mind to use “Zopf” or Challah. It’s great with sweet toppings, so I can only imagine that this must be a good way to use an older slice (they become dry so fast). My wife and I do a lot of freezing around this time of year, and I’ve never had much luck with favor when it comes to thawed stevia extracts, whcih I have used mostly in desserts. Can anyone report on how well Truvia freezes? I’ve used it before, but only in my tea! Hi Bogdan, these apple cookies froze really well for me: https://www.loveandlemons.com/apple-oatmeal-raisin-cookies/ (I wouldn’t recommend freezing the french toast, plus it’s quick and easy to just whip together on the spot). Wow, these sound great — nice update on traditional oatmeal. So glad the Truvia works, or desserts would be my downfall! Thanks for letting me know! YUM! Looks delicious and perfect for Christmas morning! Hi Jeanine, I’m so glad I stumbled across this recipe. Definitely going to have to make it for the kids on Christmas morning! I love french toast and have been trying to find a way to make it healthier but for some reason baking it never occured to me! Thanks for sharing this recipe! Just made this on the recommendation of a friend who saw the recipe on your site. It was absolutely delicious, definitely my kids favorite. I’m so glad everyone loved it!! YUM!!! Need this in my stomach pronto! We just made this for Christmas breakfast! Beautiful and delicious! Hi Kim, I’m so happy that it was a hit! This was delicious! Also added fruit as you suggested and a delicious local maple syrup! im getting hungry! those images looks delicious! 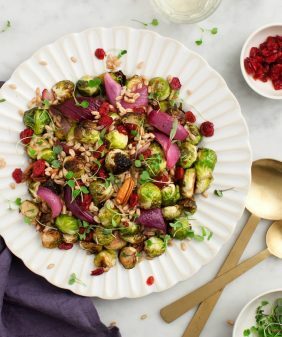 Is it possible to make this vegan? I use chia seeds for eggs but im just not sure how well that would work in this instance. Store bought egg substitutes have so many chemicals. 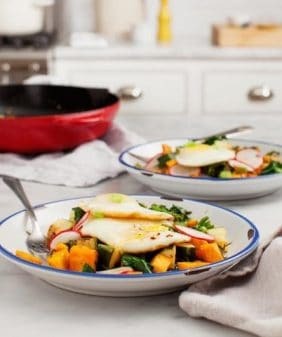 Hi Crystal, I haven’t tried to make this vegan so I’m not sure – but it is in my list to try soon so I’ll let you know! This does look so delicious! And I would love to make it for brunch with friends next week. 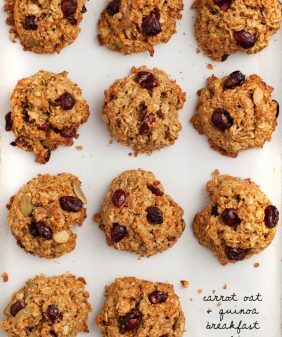 Some of them are vegan…would it work to use flax eggs in this recipe? Maybe I’ll try it out and see:). I have always loved French toast but this is a great twist on it and I am certainly going to try your recipe! Thanks for a great article. Delicious! We all loved it! Thanks, Jeanine! For French toast bake, including the one in your new cookbook, can you make it ahead of time? Looks delicious!